informative each step of the way"
workmanship from start to finish"
Sublime Landscape Gardeners started between old and new landscaping generations in Cork. Sublime offer a fantastic combination of 30 years hard landscaping & soft landscaping experience. Some of this experience includes, Landscape Garden Design & Construction, Planting Schemes & Supply, Garden Ideas, Landscape Consultation and a vast amount of other services to its potential customers. Sublime Landscape Gardeners provide affordable, unmatched quality, low maintenance and durable projects suited to Irish weather conditions. Having kept up to date with materials, planting and construction methods, combined with over 30 years of proven old school landscaping techniques, we guarantee a truly Sublime experience from design to completion of your landscaping project. An outdoor space that you enjoy spending time in, is an investment in the experience you and your family will have at your home. A beautiful garden makes you feel good and adds to your general well being. If your are genuinely serious about your garden big or small, make contact with one of the most professional and up to date landscaping business located in Cork today. Let our landscapers give you a truly, unmatched experience and prove why we stand out from the rest. We want our Landscape Design Business to Keep Growing. We endeavor to focus on the best quality achievable within our landscape design business. To achieve this quality, Sublime uses proven techniques that have been tried and tested over 30 years. We want to provide beautiful landscape designs suited to all budgets in the Cork Region. Our projects are built to last, and to withstand the unforgiving Irish weather. Sublime is the first of its kind to bring together the best of skilled trades people, horticulturists, and landscape designers, combined with over 30 years of garden design experience. We do not sub-contract any of our work. This is a key factor we believe helps us keep a higher standard of quality in all of our projects. Click on the video above to view an example of a garden design project completed by the Sublime team in 2014. 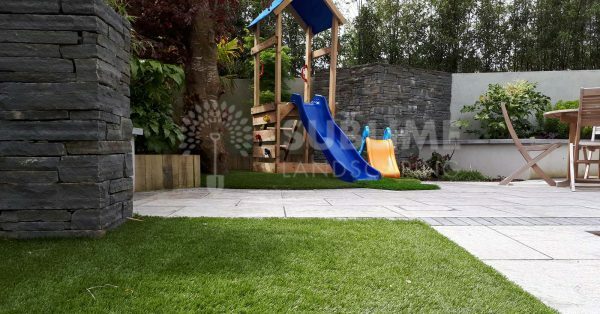 Sublime Landscaping Cork are not only a bespoke landscape construction company, but also provide Cork and the Munster region with professional high quality Artificial Grass & Installation Services. We only deal with 100% Dutch Manufactured Artificial Grass. There are many types of European & Non European Artificial Grasses available in today's markets, which vary massively in terms of UV resistance, durability, & long term resistance to lying down. 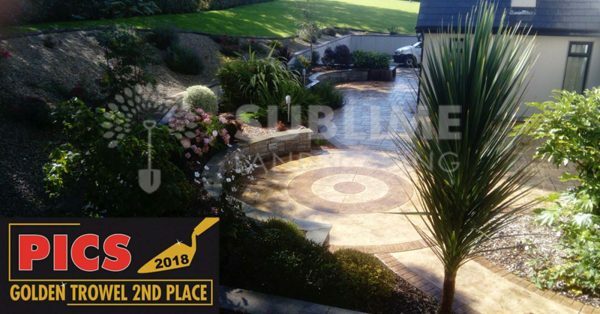 Sublime Lansdcaping Cork are delighted to recieve 2nd place for decorative concrete design in the international golden trowel awards, awarded by PICSUK. A project we completed in Glaunthaune, Cork, had decorative concrete installed, complimented by some grey quartz stone walls, planting scheme and sleeper works, all carried out by the Sublime Landscaping team directly.